Map Dimensions: 47 inches tall x 39 inches wide. Click here for more detail. 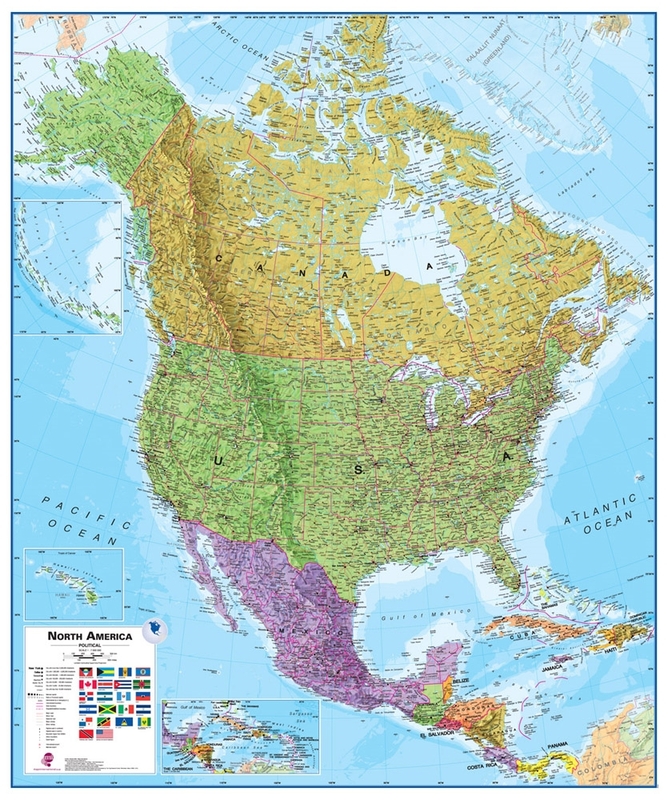 This is a great map of North America for students, schools, homes or offices. It shows the countries of North America in great detail along with their boundaries, important cities, major transportation features, lakes, rivers, mountains, deserts and other cultural and physical features. It is large, colorful, beautiful, and its lamination makes a durable map. You can write on it with dry-erase markers and wipe them off when finished. Post-It notes make great markers that cleanly remove when you are finished. This map will be an attractive and functional addition to your room, or keep it rolled for occasional use. It has wonderful blue oceans, brightly colored countries, and accurate geographic detail. Use it anywhere that a map is needed for education, display, or decor. Lamination makes it easy to hang and display. This map makes a perfect display for your travels, company activities or relationships. You can mark on it with dry-erase markers, annotate it with sticky notes, or tape photos where you want them. The lamination protects the map and allows you to wipe away markers and peel off the notes and photos. This map shows all of the major cities and capital cities of North America. They are marked with symbols that indicate their relative population. Major highways and important roads are marked on the map as red lines. Country boundaries are shown as magenta lines. Major mountain ranges are shown in shaded relief. You can trace the Rocky Mountains from Mexico, through the United States and almost to the Arctic Ocean. The map represents the continent of North America at a 1:7,000,000 equatorial scale using a Lambert Azimuthal Equal Area projection. The North American Political Map shows ocean depths with blue color shading. This allows you to easily see the coastal areas that are shallow enough for oil and gas drilling. On the continent you can see features like the Great Lakes, Hudson Bay, the Gulf of California and the large icy lakes of Northern Canada. An inset map is provided to show detail of the Caribbean Islands. Latitude and longitude lines are clearly marked. One of the most valuable uses of a map like this is in the home. When you learn about an important event in North America while watching the news or reading a news website, you can find the location on the map. This will enrich your understanding of the event and your knowledge of North American geography. This is a great map for those who are home schooling. This is a large map and we want you to receive it in perfect condition. To do that we neatly roll it - face-inwards - and insert it into a sturdy map tube. We ship all of our laminated maps through the United States Postal Service using Priority Mail. We ship no later than the next business day after your order is placed and you should receive it in just a few days. We ship Priority Mail to all customer addresses in Hawaii, Alaska, APO, FPO and all official United States Territories (Sorry, we are unable to ship any purchases to countries outside of the United States). If you order other items at the same time, your maps will be shipped in a separate tube. A total of twenty North American countries are shown on the map. They include: Antigua and Barbuda, Bahamas, Barbados, Belize, Canada, Costa Rica, Cuba, Dominica, Dominican Republic, El Salvador, Guatemala, Haiti, Honduras, Jamaica, Mexico, Nicaragua, Panama, St. Kitts and Nevis, Trinidad and Tobago, and the United States.